After about six months, the staff noticed Oscar would make his own rounds, just like the doctors and nurses. 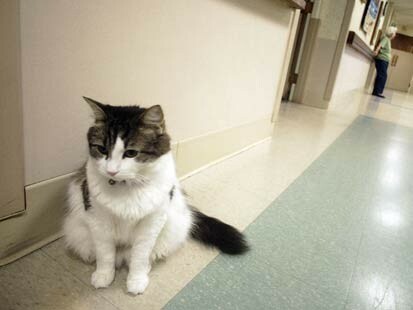 He’d sniff and observe patients, then sit beside people who would wind up dying in a few hours. Dosa said Oscar seems to take his work seriously and is generally aloof. “This is not a cat that’s friendly to people,” he said. Oscar is better at predicting death than the people who work there, said Dr. Joan Teno of Brown University, who treats patients at the nursing home and is an expert on care for the terminally ill. She was convinced of Oscar’s talent when he made his 13th correct call. Nursing home staffers aren’t concerned with explaining Oscar, so long as he gives families a better chance at saying goodbye to the dying.